Berkeley Bionics/Lockheed Martin Human Universal Load Carrier (HULC) Biomechanical Military Combat Exoskeleton Developed for Future Soldier/Warfighter Performance Enhancement: Bionic Super Soldiers on the Way? | DefenseReview.com (DR): An online tactical technology and military defense technology magazine with particular focus on the latest and greatest tactical firearms news (tactical gun news), tactical gear news and tactical shooting news. 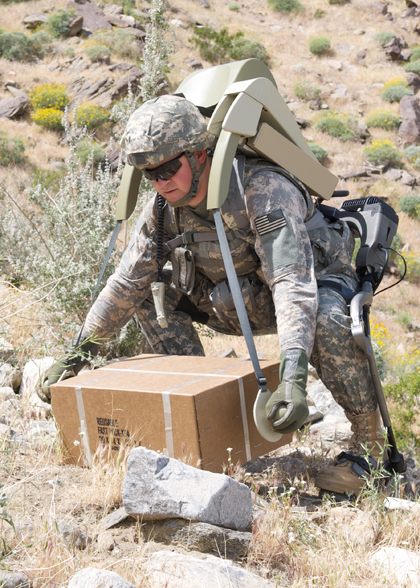 On July 14, 2010, the U.S. Army Natick Soldier Center/Soldier Systems Center awarded Lockheed Martin a $1.1 million contract to field a few test articles of the Lockheed Martin / Berkeley Bionics Human Universal Load Carrier (HULC) (pronounced “Hulk”) hydrolic-powered anthropomorphic soldier exoskeleton system. The HULC, comprised mostly of titanium, is the evolutionary progeny of the Berkeley Lower Extremity EXoskeleton (BLEEX) project, on which DefenseReview (DR) briefly reported back in 2004, and is the latest developmental version of a biomechanical soldier performance augmentation/enhancement system designed to turn ordinary human soldiers into bionic super-soldiers. It’s essentially a wearable robot, or wearable robotic system, if you will. 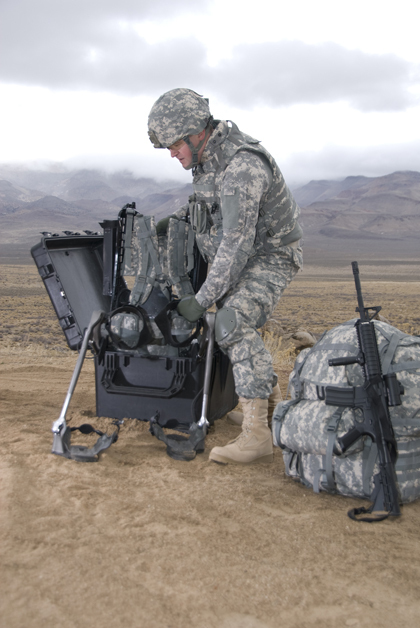 According to Berkeley Bionics and Lockheed Martin, the HULC biomechanical combat exoskeleton system enables a soldier between 5′ 4″ and 6′ 2″ to carry loads of up to 200 pounds (200 lbs) on the front or back for extended periods of times over any and all terrains by transfering the load weight and soldier’s weight to the ground. The load-carrying augmentation/enhancement ability aspect will continue to work when battery power isn’t available. 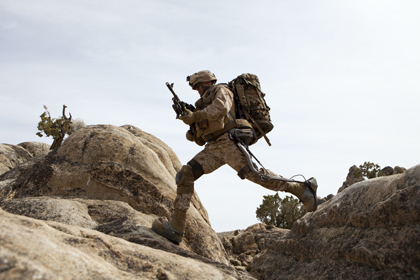 The HULC also allows a soldier to run 7 mph for long periods or 10 mph in short bursts. 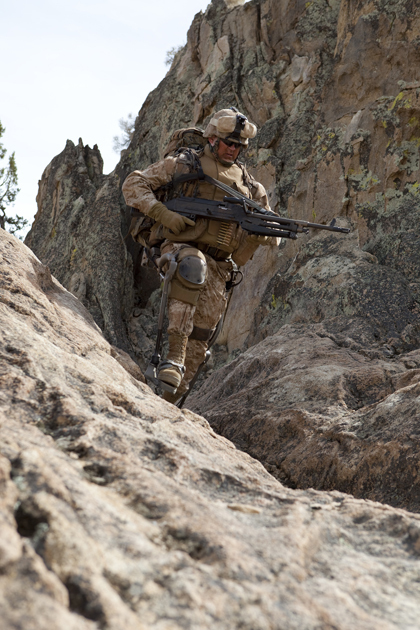 It provides the soldier with full range of motion and, according to the developers, doesn’t hinder or impede the warfighter’s movement in any way/aspect, so he/she can still jump, squat, kneel, crawl, go prone (for survival and stabilized or long-range shooting), etc., and then get right back up. One of Defense Review’s immediate and primary concerns is whether or not the HULC combat exoskeleton allows the same level of mobility and dexterity required for effective combat weapons handling/manipulation and all other combat actions during military combat. In other words, can a soldier/warfighter wearing the HULC exoskeleton system utilize his assault rifle/carbine/SBR (Short Barreled Rifle) (Colt M4/M4A1 Carbine or MK18 Mod 0/M4 CQBR SBR), machine gun (FN M240 GPMG/MMG or FN M249 SAW/LMG) or pistol just as easily and precisely as a HULCless soldier/warfighter, with absolutely no mobility or dexterity deficit, whatsoever? That’s a key question, and DR doesn’t yet know the answer. The HULC can be removed and packed up in less than 30 seconds, and appears to fold up easily for storage. Total weight without batties is 53 lbs. The HULC can “sense what users want to do and where they want to go” and move in concert with the wearer, essentially assisting him/her with whatever movement is desired and required, thanks to an onboard microcomputer with microprocessor. The Human Universal Load Carrier military combat exoskeleton is a modular system with hot-swappable accessories/components that can be quickly and easily swapped out in the field. It can be used as a backbone for body armor, heating or cooling systems, sensors, and other custom attachments, like a front-load attachment for lifting heavy objects like 155mm cannon shells, a SWAT ballistic shield attachment, and a lightweight power-assisted lifting strap system. The latter is basically the HULC’s take on the Forearm Forklift lifting straps (lifting strap system), which, if you’ve ever seen the infomercial, enables a person to lift much larger and heavier loads than would otherwise be possible. DefenseReview is interested in whether or not kinetic-energy power generator / energy-recycling technology like the nPower PEG by Tremont Electric, LLC or the prosthetic foot being developed by researchers Steven H. Collins (Department of Biomechanical Engineering, Delft University of Technology, Delft, The Netherlands) and Arthur D. Kuo (Departments of Mechanical and Biomedical Engineering, University of Michigan, Ann Arbor, Michigan, USA) can be integrated into the HULC, so the super-soldier can generate power and recharge the onboard batteries or fuel cells (more on this latter solution, later) as he moves. Perhaps a single large nPower PEG-type system, or multiple nPower PEG-type systems can be integrated. The Army might also want to look into the the viability of integrating an Equipois zeroG mechanical arm specifically designed to hold a machine gun–either a general purpose machine gun (GPMG) / medium machine gun (MMG) or light machine gun (LMG)/squad automatic weapon (SAW)–like the one used by the Colonial Marine machine gunners in Aliens (1986)–with the HULC, along with a backpack ammo feed system. You’d also have to integrate a head-mounted display (HMD) or helmet-mounted display (HMD) targeting system that’s preferably a see-through display wirelessly connected to a gun-mounted fusion-sensor (thermal/IR vision fused with night vision/I2) camera sight optical sighting system. Infrared (IR) and visible laser sights could also be mounted on the gun as a backup/redundant targeting system. It should perhaps be noted, however, even if all that can be integrated, and the HULC works as advertised, the Army shouldn’t get cocky or complacent. Remember, as the Colonial Marines depicted in the movie (Aliens) discovered, even the most advanced technology won’t save you if you haven’t properly prepared for a mission and/or are operating under bad intelligence. Technology is no replacement for our brains. It’s interesting and noteworthy that Aliens also featured a very cool, very large super-heavyweight hydrolic-powered exoskeleton cargo loader that Sigourney Weaver’s character Ripley used in the climactic fight scene with the alien queen towards the end of the film. It’s DR’s understanding that this was a working machine, although we could be wrong about this. If it indeed was (a working machine), that’s impressive. Regardless, was it and the memorable scene in which it was featured the impetus for the BLEEX/HULC project? Anything’s possible. By the way, speaking of batteries, the HULC exo-skeleton currently uses lithium-ion (li-ion) batteries, but these don’t power the HULC for a sufficient length of time and amount of use. So, what’s the solution? Well, the Lockheed Martin engineers reportedly believe that fuel cells are the ticket, and they’ve tasked Protonex Technology Corporation (PTC) with developing a fuel cell that will provide 72+ hours (that’s three-plus days) of power, which is what the Army has apparently determined is the level and duration of energy/power the HULC system and soldier end-users require. DR is curious as to how Protonex’s fuel cell technology compares to that being developed, manufactured, and marketed by UltraCell Corporation and SFC Smart Fuel Cell AG, respectively. DR had the pleasure of meeting the SFC folks and receiving an SFC Smart Fuel Cell military/defense tech demo recently (June 2010) at the Special Operations Forces Industry Conference (SOFIC) 2010 exibition in sunny Tampa, FL, and it looked pretty impressive. Anyway, if the Protonex fuel cell tech proves viable, the bionic super soldier concept could conceivably become a field-deployable leap-ahead soldier system technology very soon. Regarding all-terrain mobility and agility, DR would think that snowshoes (or snowshoe attachments) can be designed and developed for the HULC, so it can be utilized/worn in arctic environments for arctic warfare operations. And, as strange as it may read, DR would be interested to know if integrating a Poweriser attachment might be viable for long-range mobility and agility augmentation/enhancement. Powerisers are essentially jumping boots/stilts that employ powerful springs, which allow the user to jump very high, jump long distances, run very fast with minimal effort, and perform acrobatics. Two obvious negatives to Powerisers is that they require a significant level of training to use them properly, and they significantly increase the chance of injury to the user (and potential increased legal and financial liability to whatever organization approves them), and military funds are challenged, at the moment. Jim Ni, Program Manager, Sensors Datalinks and Advanced Programs at Lockheed Martin, is the HULC program manager. Previous: Can the FN MK17 SCAR-H (SCAR-Heavy) 7.62mm Common Receiver and 5.56mm Caliber Conversion Kit Save the SCAR Program? Next: Shipborne Raytheon Laser Weapon System (LaWS) Shoots Down Four Drone Aircraft over the Water in U.S. Navy Test (Video! ): Can it Protect our Aircraft Carriers from the Latest Above-Water Threats?